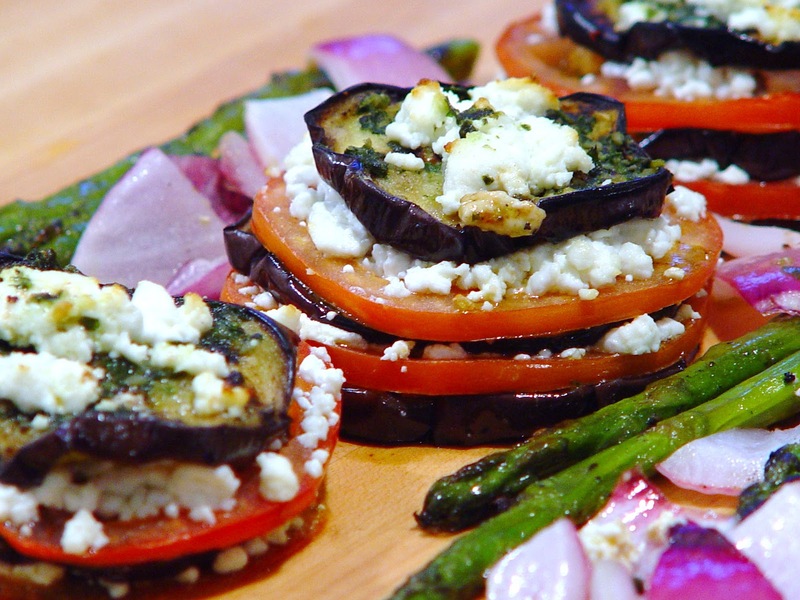 Grilled Eggplant Stacks with Goat Cheese, Tomato and Basil Oil. A great summertime dish, this is an incredibly delicious recipe. I like to serve these eggplant stacks with grilled steak or chicken but these tasty stacks are good enough all on their own. The combination of the basil oil drizzled on the layers of eggplant with the goat cheese and tomato work so well together. I couldn't wait to post these because they are so good. You can't go wrong if you want to use feta instead of the goat cheese, I made a few with each and they are both equally delicious. If you are entertaining, these are a perfect choice to make ahead of time and than bake when you are ready to serve and they make a beautiful presentation! Cut of the eggplant into ½” thick rounds. Lightly season them with salt on both sides and let sit on a paper towel for 30 minutes to let water to come out of the eggplant. Brush or drizzle olive oil on top of each slice and grill them for 2 -3 minutes each side until cooked. Blend the basil leaves with 4 tablespoons olive oil, 2 garlic cloves, lemon juice, and 1 teaspoon salt in a food processor or blender until smooth. On an oiled baking pan or using parchment paper, arrange 4 eggplant rounds side by side. Spread 1/2 tablespoon of the basil-garlic mixture on top of each one, then generously sprinkle the cheese crumbs. Top each with tomato rings. Add another layer of eggplant, basil spread, cheese and tomato rounds and top with the rest of the crumbled feta. Make as many layers as you can. Usually, 1 large eggplant will make 4, 3 layer stacks. Bake for approximately 15-20 minutes until the tomatoes are wilted and the cheese is soft and melted. Basil, garlic and olive oil spread. Delicious!!! Use a mini food processor or an immersion blender. Grilled eggplant slices ready to be assembled.